Robert Melvin (Lucky) Luck was as familiar to the Hawaiian scene as pineapple and poi � yet his birthplace was inland Waco, Texas, far from the islands and the sea. Son of a professional entertainer, Lucky's first interest in music was born on the campus of a St. Louis (Missouri) high school, where he sang in a glee club with William F. Quinn, Hawaii's ex-governor. Lucky's fascination for Polynesia began while wearing a U. S. Marine uniform in Pago Pago. There he mastered the Samoan language well enough to serve as an interpreter during World War II. His introduction to the Sandwich Isles in 1945 was a "lucky break" for Hawaii. Since then, enchanted with Hawaiian aloha, culture and music, the happy-go-lucky entertainer captivated audiences in radio, television, recording and movie fields. This delightful compilation by Mahalo records provides one more lucky charm that's certain to please kama'aina (old-timer) and malihini (newcomer) alike. THERE'S NO PLACE LIKE HAWAII: Lucky's TV theme song as done by the entire group. MYNAH BIRD: A Lucky favorite. I STAY LOST: Lucky sings the city road map. 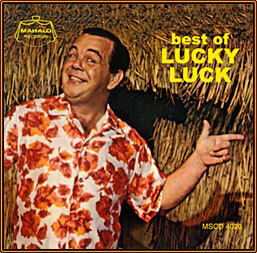 LUCKY HULA: Lucky and composer get together to sing a hula number especially written for Lucky by Mel Peterson, Lucky's unofficial theme song. HAPA HAOLE HULA GIRL: Lucky sings about a hula "gal." NANI KOOLAU: Lucky sings and swings on harmonica with Chick Floyd's orchestra. SUSIE ANNA E: Lucky sings an old favorite about a "wahine." KANAKA NUI HOTEL: A take-off of the "Royal Hawaiian Hotel" with Lucky singing (talking). PUAATORO HELLABEY: Tahitian song featuring Lucky on harmonica. MAGIC PUA DOG: Lucky tells the story of Pua Dog going to Waipio Valley looking for awa. E NAUGHTY NAUGHTY MAI NEI: Composer Mel Peterson sings his own song with Lucky coaching. KONI AU MARCH: "General" Luck leads Chick Floyd's band in a parade and demonstrates his pidgin English. KANAKA CHRISTMAS: Uncle Lucky tells a Christmas story to the children about a menehune. 12 DAYS OF CHRISTMAS: Another Lucky favorite where he was best known for his pidgin.